Cargo handling, storage, customs clearance, transportation by sea/land, import/export procedures and others – we are the total logistics service provider in the Port of Nagoya area. 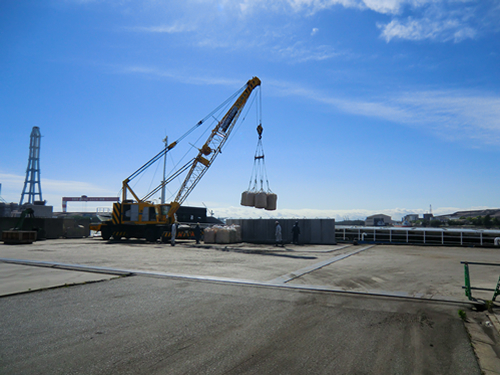 With the Port of Nagoya area constituting our main field of operations, we have developed integrated operational sites primarily based at Yura Wharf (Yura Futo) in West-3 area to handle everything from silica sand and other ceramic materials and mineral substances to chemicals and construction materials and handle important cargo on behalf of our clients according to a posture of thorough preparation. Measuring a total of 250 meters in length and featuring a private wharf alongside which large ships of up to 49,000 DWT can be brought, Yura Wharf (Yura Futo) can of course rapidly fulfill the cargo-handling requests of our clients and is furnished with facilities and systems designed to accommodate the diverse needs of our clients in terms of actual cargo-handling work, including a level luffing unloader capable of efficiently loading and unloading large volumes of bulk cargo and a cement silo that can unload cargo directly from a mother ship. Given that we have amassed extensive know-how in dealing with a wide range of cargoes (including raw materials and chemicals that are subject to complicated handling procedures), it is hardly surprising that we can manage to safely and smoothly engage in cargo disposition. Our team of highly proficient operators will handle your valuable cargo with the utmost of care. Clients can make the most of what we have to offer by utilizing our comprehensive integrated logistical services, which are performed seamlessly over an optimal combination of land- and sea-based routes. Best package plans that combine everything from cargo handling to storage and shipping are proposed to our clients. Our personnel are ready to fulfill your requests with a singleness of purpose. Copyright © 2019 Yura Kaiun Co., Ltd. All Rights Reserved.